IBM is one of the oldest and largest computer companies in the world. And while its history is checkered with successes and failures — not to mention at least one near-death experience — it’s always bounced back. So how does a big B2B company continue to succeed, even when they’re down on their luck? They used clever, carefully-planned marketing campaigns every step of the way. These are three of IBM’s biggest marketing triumphs that have helped the company keep its doors open for more than a century. 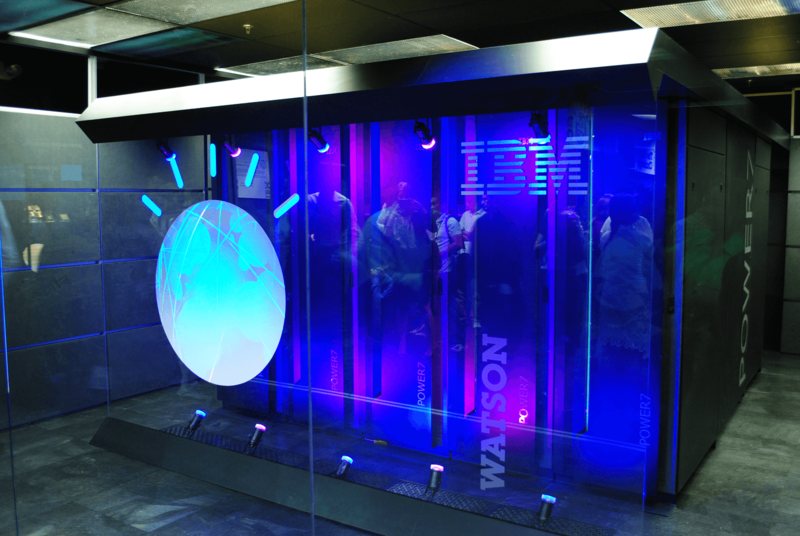 You may have heard of Watson, IBM’s supercomputer named after the company’s founder, Thomas J. Watson. The supercomputer project flew under the pop culture radar until 2011, when IBM announced that it’d play Jeopardy against two of the game’s former champions, Brad Rutter and Ken Jennings. You can check out the first round below. Not only did Watson play, it won — and by a huge margin. The supercomputer won $1 million total, which IBM split in half and donated to two charities. But the surprising part about the game wasn’t just Watson’s victory — it was how quickly the machine calculated answers to questions and stated them in colloquial English. With that kind of power, it’s not surprising that there was more to Watson than the column that IBM set up for the game show. Its brain was much, much larger than that. Although today, it can pretty much fit in a desk drawer. So why did IBM launch a huge marketing campaign about their supercomputer playing a gameshow? Watson’s appearance on Jeopardy made it an instant celebrity. IBM wanted their initial investment to pay off eventually, and it did. Watson has found a home in healthcare. It serves as a lung cancer specialist and an expert in the incredibly-complicated insurance niche of utilization management. As a lung care specialist, it pulls on huge stores of historical data to show nurses and doctors different degrees of confidence in a decision about lung cancer. It can interpret symptoms and recommend drugs. It’s so accurate that — according to IBM — 90% of nurses who use Watson take its advice. In utilization management cases, Watson provides accurate advice roughly 90% of the time. Best of all, Watson’s cloud connection allows it to store and share data with other “instances” of itself, meaning that hospitals with Watson can automatically store and share data to improve patient care. Watson isn’t the room-sized computer you saw above, either. IBM’s computer scientists have improved Watson over the past few years, and it’s now smaller and faster than ever. Today, the supercomputer is the size of three stacked pizza boxes, and it can easily fit in a company’s server room. For IBM, Watson is the future. And it could very well be the future of institutionalized medicine, too. Because of that, it’s already started earning IBM a fortune, and it’ll probably continue over the next few decades. IBM made Watson famous before the supercomputer was even ready for regular work. Then, they optimized Watson for B2B applications — specifically, healthcare and insurance. And now, they’re expanding Watson’s capabilities for additional industries. IBM followed a simple formula of creating an innovative product (Watson), promoting it by accomplishing a world-wide first (a computer winning Jeopardy), and orienting it to clients who needed the product’s power the most (healthcare providers). While executing this plan took years, the overall approach couldn’t be more textbook. Make something new, promote it, and sell it. All this power lets Watson perform 80 trillion operations per second and understand 200 million pages of text in three seconds. You can find more on Watson’s specifications on IBM’s site. Smarter Planet is a sprawling marketing campaign that’s designed to promote technology and data interconnection throughout the world. The campaign is focused on technology and how it can help people around the world. This encouragement and collection of new ideas is similar to TED talks, but controlled entirely by IBM. This is a massive campaign for any company, and it probably wouldn’t work for smaller companies just based on its sheer size. But the smartest part about this campaign is that it can attract the attention of a wide audience. Still, the company is focused on its primary customer base: Other businesses. The main page for Smarter Planet highlights nine industries where businesses can use their technology, which just so happen to be goldmines of potential clients. Essentially, Smarter Planet is an effective way of promoting IBM’s ideology among consumers and appealing to new clients at the same time, making it an excellent overall campaign. But can such a huge, sweeping, generalized program actually deliver results? From a production standpoint, the results of this campaign include an incredible quantity of high-quality content, like IBM’s Wild Ducks podcast. From a communications standpoint, the results of this campaign include speeches, interviews, op-eds, advocacy, and general discussion. And from a business standpoint, Smarter Planet has been paying off for years. IBM started the initiative in 2008, and in 2011 they achieved a 16-year high in revenue: $106.92 billion. So for five straight years, IBM enjoyed a huge increase in revenue. And revenue isn’t even the CEO’s top priority. IBM established one of the largest, most inclusive marketing campaigns that the world has ever seen. They drew in potential clients by creating and publishing high-quality content tailored to specific industries and showed those industries how their technology could help. Every kind of content they showed discussed positive results — or the potential for positive results — of IBM’s involvement with a company, government, or non-profit organization. That made the campaign a hybrid of corporate initiative, content marketing, charity work, and brand building, just to name a few. Overall, IBM went big — really big — but still maintained its focus on its primary clients. The fact that it led into some of IBM’s best years (in terms of revenue) speaks worlds about its success. The “cognitive” in Cognitive Era comes from cognitive machines, or systems that are capable of learning like IBM’s Watson. But the campaign promotes more than that. In general, it promotes security, cloud connectivity, intelligence, and the next big step in day-to-day business operations. Specifically, it promotes its own products and ideas to get those points across. One part of the Cognitive Era campaign features Watson alongside different people to make the system — and IBM as a whole — feel more approachable. The gist is that with IBM’s help, anything is possible. Neither of those have simple solutions, but IBM is illustrating the huge scope of what the company — and Watson — could tackle over the coming years. Basically, IBM wants to take everything it’s done with Watson, Smarter Planet, and other projects and condense them into one streamlined marriage of artificial and human intelligence. And, naturally, Watson is the backbone of that operation. Since this is one of IBM’s newest campaigns, it’s difficult to say whether or not it’s successful. In fact, if we use the same revenue metric that we used for the Smarter Planet campaign, “Cognitive Era” actually looks like a bust since IBM’s earnings have slipped over the past 13 quarters. But, just like IBM showed with Watson on Jeopardy, they’re going for long-term profits and results — not quick bumps in revenue. With that in mind, it could be one, five, or even 10 years before this campaign achieves positive results. We’ll have to check back to offer a definitive answer. IBM situated themselves at the forefront of a digital revolution that has the potential to be just as big as the invention of the personal computer: Artificial intelligence that continually learns, adapts, and advises. With so much data and power — not to mention IBM’s constant innovations — Watson and other AIs like it could be the wave of the future. The applications of programs like Watson are to make the world a better place, as far as IBM is apparently concerned. Cancer treatment, city planning, translating, it’s all there in a compact, inter-connected digital intelligence. And given the steady success of Watson already, IBM may have the ability to usher in a sci-fi era of competent artificial intelligence. Are there any B2B marketing campaigns that you enjoyed over the years? Or any that were especially effective? Let me know in the comments!